New Developments in EU and International Copyright Law draws a comprehensive picture of current, pending, and proposed copyright developments – legislation, ‘communications’, white papers and court decisions – at both European Union and the World Intellectual Property Organization levels. More than a source of income and a means of protection for creators, rightholders and the creative and entertainment industries, copyright is also a vehicle for technological advances and economic development. Throughout the European Union, industries with intensive emphasis on intellectual property rights (mainly copyright) generate more than a quarter of employment and more than a third of economic activity. Yet copyright continues to be plagued by problematic attempts to balance the interests of rightholders, the public, consumers, intermediaries, collecting societies, different national legal traditions and other forces, European and global. Although it has met certain challenges – some of those involving new technologies – copyright ‘stretching’ may have reached its limit. This book thus offers a multi-faceted approach to comprehend the ongoing developments in copyright, taking into account politics, policies, the law and what is attainable in the given circumstances. role of the European Court of Justice. These topics analysed form the cutting edge of developments in copyright law in the EU and WIPO which, in turn, also constitutes the ‘bigger’ picture of copyright in the EU and WIPO. 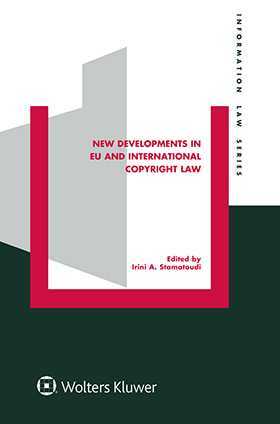 Twenty-two well-known and prestigious experts on intellectual property law from seventeen jurisdictions worldwide, have contributed essays on particular trends in copyright. Policy recommendations, as well as a detailed conceptual framework for a potential EU Copyright Code are set forth. New Developments in EU and International Copyright Law enables the reader to gain an overview of what is to expect in terms of EU harmonisation and current and future work in WIPO. As a detailed and thoughtful overview of current trends in copyright internationally, this book has no peers. It is sure to be welcomed by practitioners, policymakers, academics, and business leaders for whom intellectual property rights and especially copyright, are of the first importance. Chapter 7 Orphan Works, Out-of-Commerce Works and Making the European Cultural Heritage Available: ‘Are We Nearly There Yet’? Chapter 12 How Much Communication to the Public Is ‘Communication to the Public’? Chapter 13 Digital Exhaustion of Copyright in the EU or Shall We Cease Being so Schizophrenic? Chapter 16 Flexible Copyright: Can EU Author’s Right Accommodate Fair Use?